John Ford’s late career was dotted with heavily revisionist takes on the western cinematic mythology he helped to define, whether attacks on the genre’s racism or even its legacy as a romanticized outpost of uncivilized abandon. 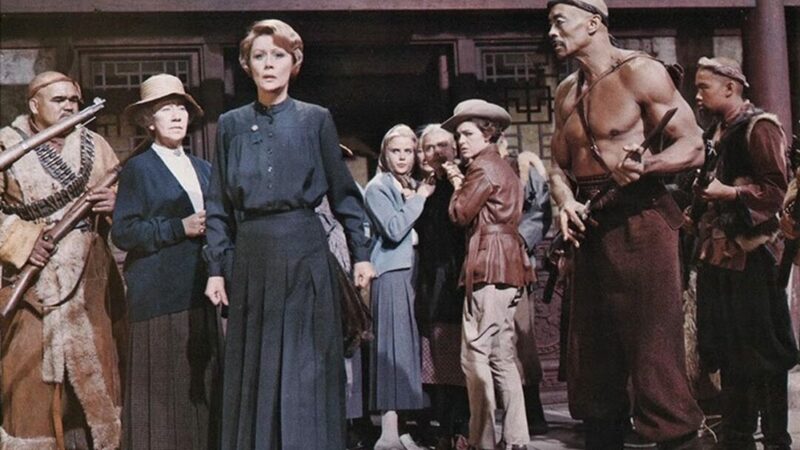 Ford’s final film, 7 Women, gave these critiques their purest expression by radically altering the director’s context: instead of shooting on location in Monument Valley, he used soundstages to stand in for China, and instead of an assortment of rugged, seriocomic men, the cast consists of missionary women afflicted with either reticence, indignant superiority, or cowardice. Only a secular doctor, Cartwright (Anne Bancroft), displays any sense of capacity, and she is regularly hounded by the fundamentalist mission leader Agatha (Margaret Leighton). Ford regularly juxtaposed those who lived Christlike lives of sacrifice and betterment with pharisaical sanctimony, and Agatha’s xenophobic, undersexed fury regularly clashes with Cartwright’s direct action. In another Ford film, Agatha might have been the respectable matriarch of a frontier family, but here, she is everything wrong about the frontier, treating casually seized land as naturalized U.S. soil, then reacting with fear and rage when the rightful owners come to kick out the squatters. Ford’s characteristic ambivalence observes all, whether the overt racism of a pregnant missionary demanding Cartwright’s attention while the doctor attempts to contain a plague among locals, or Cartwright’s own, unapologetic inability to get the names of servants correct, indulging in her own ignorance even while trying to save lives. The extensive use of sets makes “exterior” scenes set against minimal bricolage and painted skies every bit as claustrophobic as shots around the mission’s cold dining room, leaden with judgment and paranoia. As with Black Narcissus, the film resolutely takes the position that not only is the mission doomed to fail, but that it is an execrable cause to begin with, the epitome of arrogant Western expansionism. As such, the film works as a metaphorical critique of the American frontier clashes, more powerful as a roundabout commentary than the more explicit but inconsistent Cheyenne Autumn. Ford’s characteristic ambivalence observes all, whether the overt racism of a pregnant missionary demanding Cartwright’s attention while the doctor attempts to contain a plague among locals, or Cartwright’s own, unapologetic inability to get the names of servants correct, indulging in her own ignorance even while trying to save lives. But the film also honors the genuine sacrifices made, especially in terse communication between the worldlier women when bandits make their way into camp, as in the bone-chilling exchange between Cartwright and an abducted local woman: “Miss Ming, are you alright?” And the ragged sigh with which the woman replies, “I am alive.” Even taking into consideration the director’s occasionally nightmarish war films, this is Ford’s most apocalyptic movie, one that demands a sacrifice of its protagonist that the men of Monument Valley never faced, and one that only earns her the condemnation of Agatha in a fit of confused desire and disgust. The Fordian hero rode off into the sunset as a Mosaic figure, unable to enter the promised land to which they led followers; that seems downright wistful compared to what awaits the stronger figures of 7 Women. At best, they look forward to a painless death.